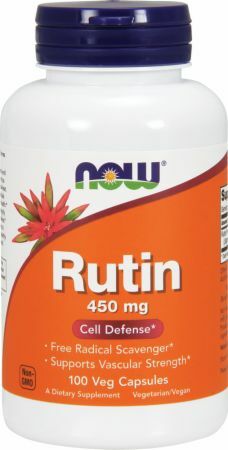 Rutin is a flavonoid glycoside also called rutoside,rcetin-3-rutinoside and sophorin. Often referred to as a bioflavonoid, it is a powerful antioxidant found in both citrus and non-citrus sources, such as buckwheat. NOW provides Rutin derived from a non-citrus source. Cellulose (Capsule), Stearic Acid (vegetable source), and Silica. Directions For Rutin: As a dietary supplement, take 1 Vcapï¿½ daily, preferably with a meal.